It's that time when the Christmas cards start coming in the mail. What to do with them? 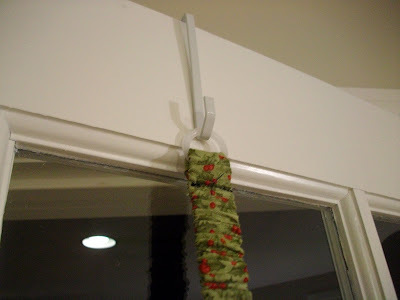 Why not hang them on the door. 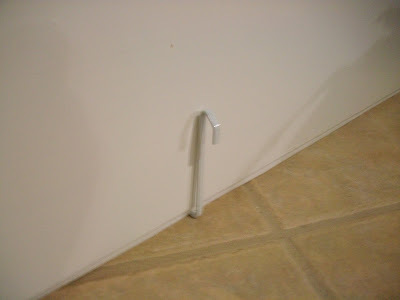 I know this is not a new idea, but this Tool Time Tuesday uses over the door hooks from the hardware store. 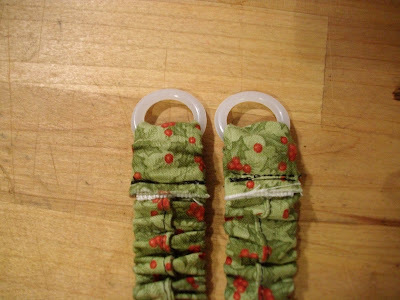 For this project you will need fabric, 2 plastic rings, 2 over the door hangers and elastic. I used 3/4", but you can use wider...I just didn't have it. These little extras are for the clips that hold the cards on. 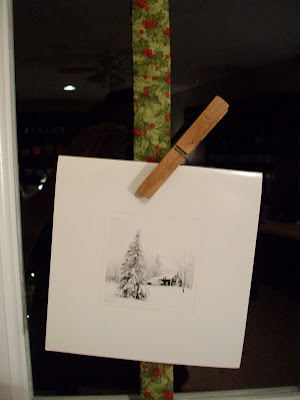 You can use anything even clothespins. 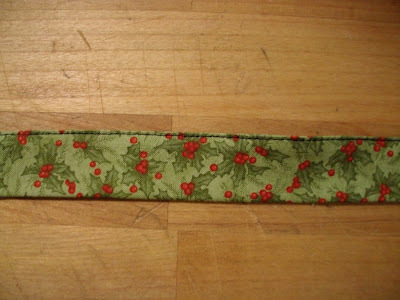 I started with 2 strips of 2 1/2" wide Christmas fabric. 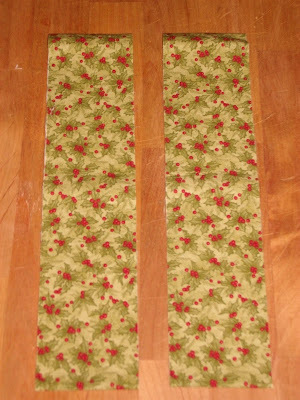 Cut them the width of fabric...so 42"-44" long. 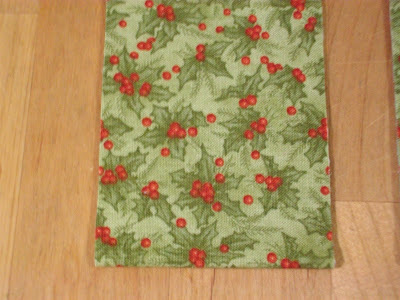 Here's a close up of the fabric...Moda by 3 Sisters, I think Maison de Noel. 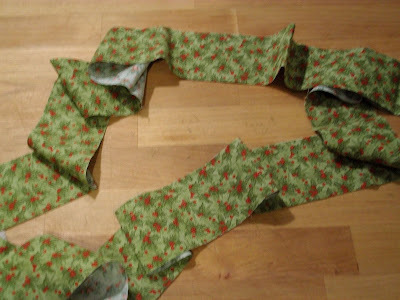 Take the 2 strips and sew the short ends right sides together. 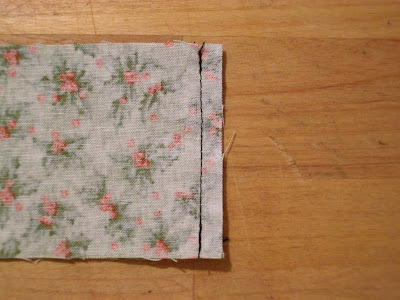 I used 1/4" seam in black thread so you can see. Now you have one long strip about 88" long. 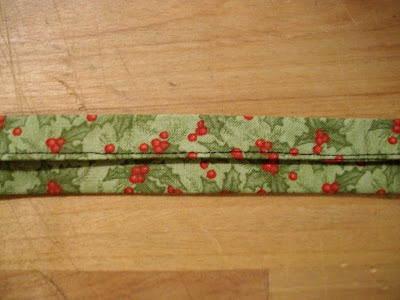 Fold over both long sides about 1/4". Press with iron. 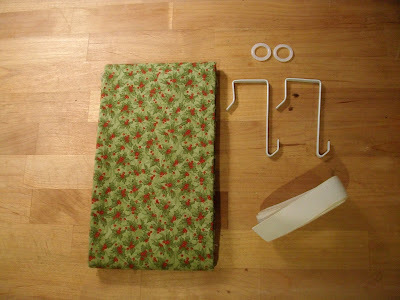 Fold in half wrong sides together...the entire length. 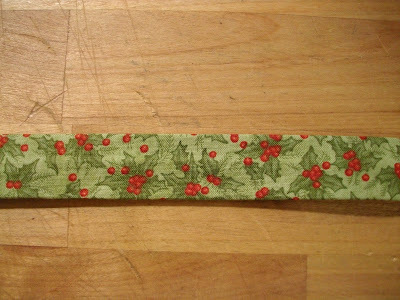 The piece should now be about 1 inch wide by 88" long. 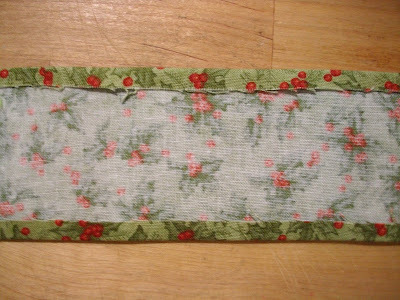 Now sew close to the edge along the full length of the strip. 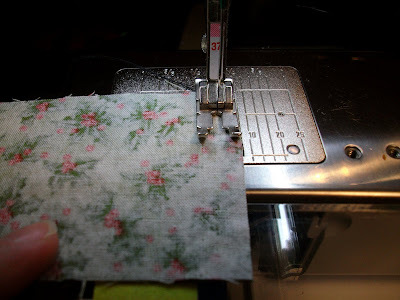 Roll this seam to the middle and press. Flip it over and you now have a flat tube, without having to turn it right side out!! 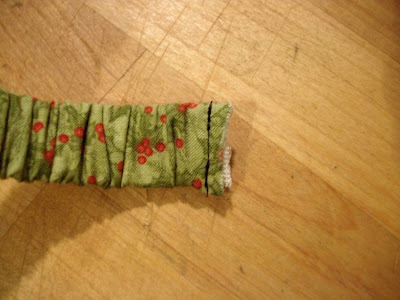 Take your elastic and cut a piece about 48" long. Why that length? Not sure...I just hung it on the hook, stretched it out and then cut it. 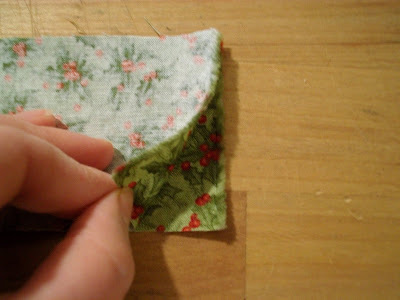 The trick is to have about double the amount of fabric as elastic to give it the ruffled effect. 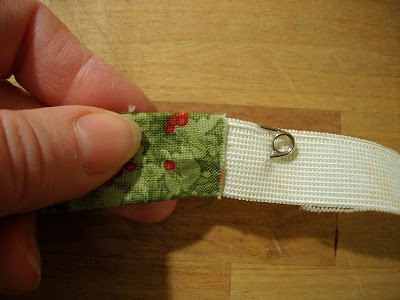 Now use a safety pin to run the elastic through. 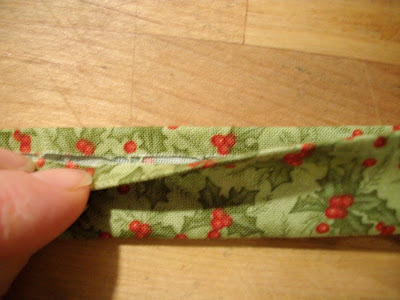 Sew through all thicknesses to secure the elastic at both ends. 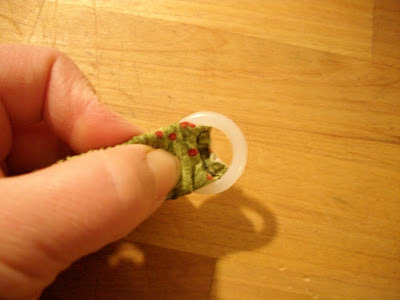 Push the end through the ring and fold over to the side with the seam. 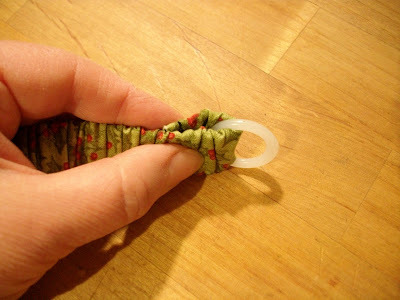 Sew down both ends to secure. 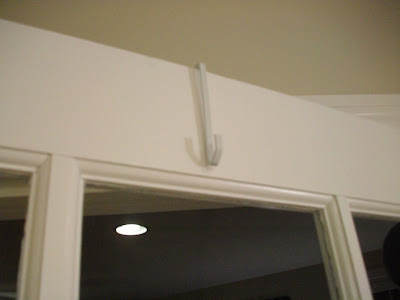 Place one hook on the top of the door. and the other on the bottom of the door, upside down. Loop one ring over each hook. 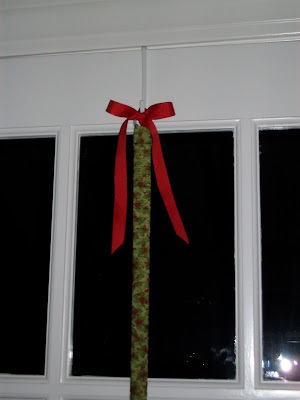 Add a ribbon or greenery for decoration. 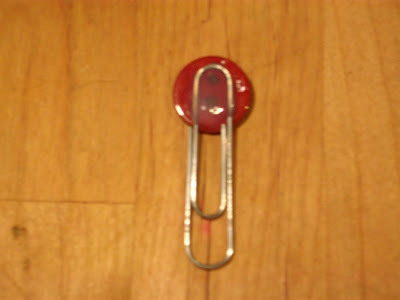 Now you can hot glue little doo dads to the paper clips for added color. and now you are ready to hang all your cards as they start coming in. Don't forget the clothespins too. You can always paint them to match. Bring 'em on postman...I'm ready!! The possibilities are endless for these and so cute to have the fabrics match the room. This is great idea Karen! 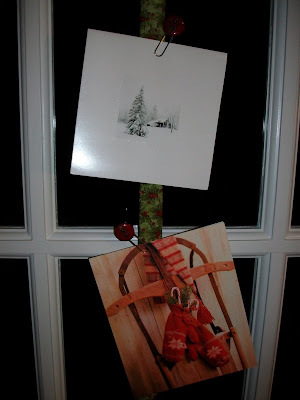 Think I might need to make one for my sewing room later on and I love the Christmas card use... perfect! 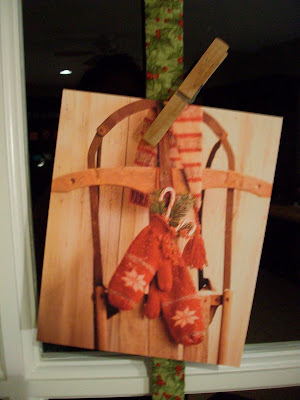 Your decorating hints and tips and especially your decorations look wonderful! Nothing related to this post, but the I spy swap package arrived Saturday! Woohoo! So many lovely fabrics. Thanks again for hosting and also for the nice gift you made for each of us! Love this idea! Another great one. Thanks. 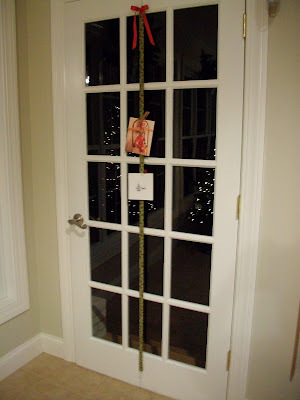 I always thought of hanging wide ribbon down the door for cards but didn't because I thought it would swing and sway every time someone used the door. This solves that problem. Yay! I'm going to try it. Thanks. That is something that I have never seen before and it is brilliant! What a clever idea. I am always amazed at your creativity. Ah, I so look forward to Tuesdays! 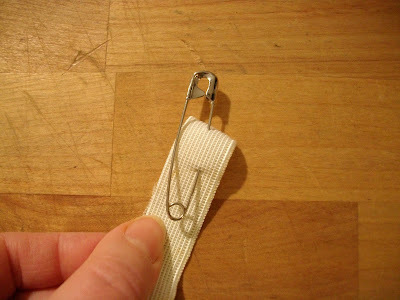 I use double sided tape attach clothes pin and it's inside my cupboard for recipes. I also have same thing for my rubber gloves..works so well. Great idea. 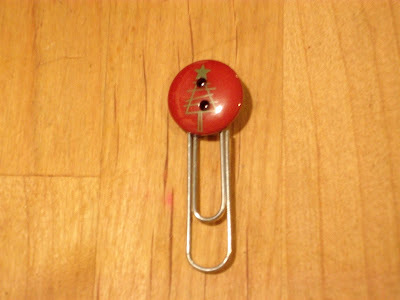 I love the buttons on the paper clips. Love this idea. I think I will try it. Never saw this done before. This is a great idea! 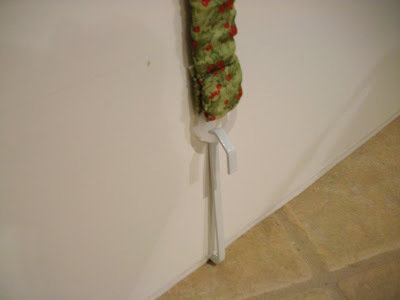 I am going to try the one inside the kitchen cabinent..but I'm going to use my fav and yours: Command strips with hooks! I just LOVE those puppies...I should buy them by the case! Great idea again Karen! Thanks! 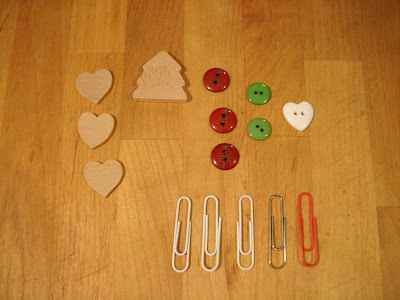 I did show my "I Spy" blocks on my site last week--but keep forgetting to say a BIG thankyou for organizing it--I can;t wait to work with the blocks--plus I have decided it is about the only kind of swap I want to do from now on--so hope you decide to do another one sometime in the new year????? 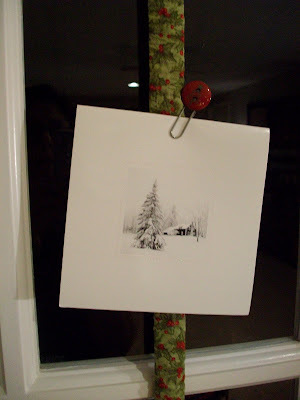 Just wanted to tell you that I bought some of the removable hooks and have already put up two: one on the front door for my Quilted Tree and one holding a calendar. These are really great: thanks again. 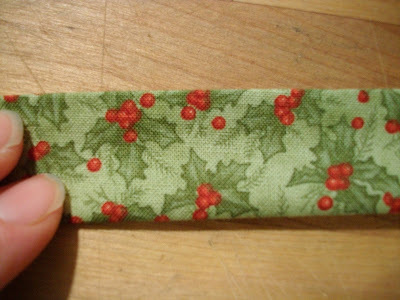 This would be cute to hold little girl barrettes on too! You are too clever!! What a great idea. I might even be able to adapt this to use in my mom's nursing home room. Her bulletin board fills up fast! I just scrolled through your decorating pictures, WOW, can I come to your house? Or better yet, can you come to my house and decorate for me? What a big job, it's beautiful. Thanks so much for sharing your corner of the world! Great idea - I'm going to try this! And maybe a birthday one, too. My kids get lots of birthday cards from family and we usually tack them up, but this would be so much better. You have a beautiful tree, too! This is really a cool idea and with tons of uses. Great job. Thanks for the instructions. I post a picture on my blog of mine. I love this! It is SEW cute! I think on the inside of a cupboard I would use cup hooks to hold it on, just my my one cent's worth..haha!p.s. I've been on your site all afternoon going through all the TTT's!I'm soooo glad I found your blog! Sew much fun!